September was unseasonably hot in the western United States. Now, that October has come the temperatures have dropped into the high 40s and low 50s (Fahrenheit) over the last week. I love running in these temperatures. I love the colors of the changing leaves and the crispness of the air. I run outside year round. Here in Utah, the temperatures get below zero in January and sometimes in December too. The lower the temperatures the more clothing I put on. Sometimes we have a few inches of snow and biting wind on Halloween. It makes trick or treating rather unpleasant. At 50 degrees Fahrenheit, I wear a long sleeve shirt, but I’m still in shorts. At 40 degrees Fahrenheit, I have long pants, a long sleeve shirt and a short sleeve shirt. Possibly gloves as well. Once the temperature starts slipping down to 35 or lower, my thermal tights and long sleeve shirts come out. The colder it gets the more thermal layers I wear. My outer layer is windproof. My feet stay warm with one pair of socks no matter how cold it is outside, so long as they stay dry. My hands are another matter entirely. I wear three layers on my hands and then slide hand warmers in as well. In January, any water I carry freezes solid on long runs. Carrying a handheld water bottle is impossible with three pairs of gloves on. Carrying water only makes my hand colder anyway. I use my hydration pack in the winter. You can buy an insulator for the tube so it doesn’t freeze up. I blow the water out of my tube each time so that it doesn’t freeze. Any gu you pack along with you should be put in an inside pocket so you can use it when needed. If it is in your hydration pack or an outside pocket it will freeze. There are a few different brands of spikes you can get for your shoes, that will prevent you from sliding on the ice. If the temperature is below ten degrees Fahrenheit, I will split my run up doing ten miles outside and then finishing the rest inside on a treadmill. Frost bite doesn’t seem like fun to me. 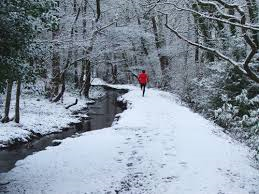 Winter is an amazing time to run so long as you have the right gear to do it safely. The blanket of white that covers the ground in the early morning hours before any beasty children or dogs have put any footprints in it, is a treat. The moon’s light or the streetlights make it look like diamonds covering the ground. Christmas lights always make me smile and I recall Christmas mornings I’ve spent with my children and the wonder on their little faces. Start unpacking the winter gear, it will be here before we know it.